Between 1988 and 1991, Richard Frankland, filmmaker, poet, musician and activist was an investigator with the Royal Commission into Aboriginal Deaths in Custody. The experience changed his life. He made the film ‘No Way to Forget’, a triumph in Cannes in 1996, as a way of trying to understand what he had been through. 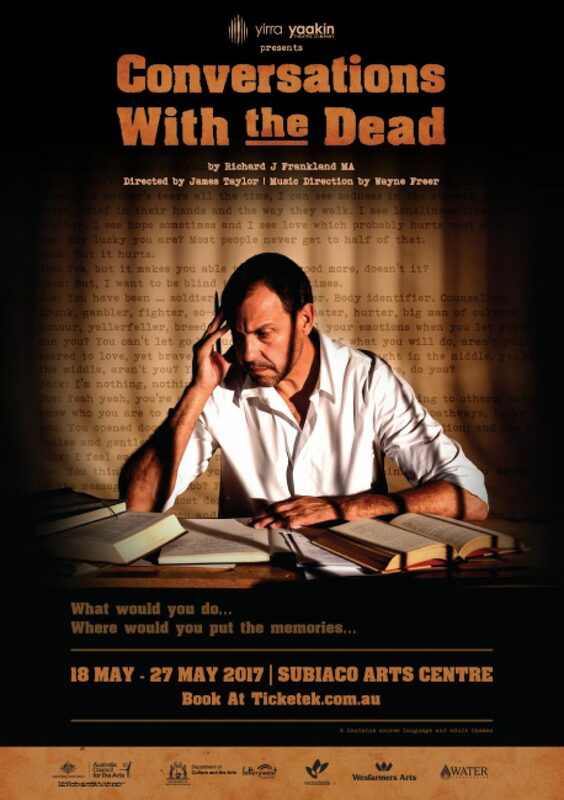 In ‘Conversations with the Dead’, he had created the tragedy of Jack, a young, ambitious Koori, well-connected in the worlds of black and white politics, whose mission requires him to straddle the contradictions of both worlds. But how can he be true to his brothers and his past, when the white world for which he works doesn’t understand the subtleties, the strengths, the pain and the rage of the people whose deaths he is investigating? Our play, in conjunction with our free Education Kit (available from 18th of May), can be used as a resource to teach the Cross Curriculum Priority – Aboriginal and Torres Strait Islander histories and cultures, as both the play and the Education Kit will be linked to the Western Australian Curriculum. If you are interested in booking this play please contact our Education Officer. Education Kits are provided free of charge with any booking of this play. They are also available for individual purchase at $30.00 + GST (plus postage). If you are interested in purchasing an Education Kit, please complete an Order Form and return it to our Education Manager.